"Statistical reasoning may be defined as the way people reason with statistical ideas and make sense of statistical information (Garfield and Gal 1999). This involves making interpretations based on sets of data, graphical representations, and statistical summaries. Much of statistical reasoning combines ideas about data and chance, which leads to making inferences and interpreting statistical results. Underlying this reasoning is a conceptual understanding of important ideas, such as distribution, center, spread, association, uncertainty, randomness, and sampling." Garfield, 2004,The Challenge of Developing Statistical Reasoning. Speaking of Statistics: 1.1 What Is/Are Statistics? 1.2 Sampling, 1.3 Types of Statistical Study, 1.4 Should You Believe a Statistical Study? Focus on Sociology: Does Daycare Breed Bullies? Focus on Public Health: Is Your Lifestyle Healthy? Measurement In Statistics: 2.1 Data Types and Levels of Measurement, 2.2 Dealing with Errors, 2.3 Uses of Percentages in Statistics, 2.4 Index Numbers Focus on Politics: Who Benefits from a Tax Cut? Focus on Economics: Does the CPI Really Measure Inflation? Visual Displays of Data: 3.1 Frequency Tables, 3.2 Picturing Distributions of Data, 3.3 Graphics in the Media, 3.4 A Few Cautions About Graphics, Focus on History: Can War Be Described with a Graph?, Focus on Environment: How Much Carbon Dioxide Is in the Atmosphere? Describing Data: 4.1 What is Average?, 4.2 Shapes of Distributions, 4.3 Measures of Variation, Focus on the Stock Market: What's Average About the Dow?, Focus on Economics: Are the Rich Getting Richer? A Normal World: 5.1 What is Normal?, 5.2 Properties of the Normal Distribution, 5.3 The Central Limit Theorem, Focus on Education: What Do SAT Scores Mean?, Focus on Psychology: Are We Smarter Than Our Parents? Probability in Statistics: 6.1 The Role of Probability in Statistics: Statistical Significance, 6.2 Basics of Probability, 6.3 Probabilities with Large Numbers, 6.4 Combining Probabilities, Focus on Social Science: Are Lotteries Fair? Focus on Law: Is DNA Fingerprinting Reliable? Correlation and Causality: 7.1 Seeking Correlation, 7.2 Interpreting Correlations, 7.3 Best-Fit Lines and Prediction, 7.4 The Search for Causality, Focus on Education: What Helps Children Read?, Focus on Public Health: What Do Disease Clusters Mean? From Samples to Populations: 8.1 Sampling Distributions, 8.2 Estimating Population Means, 8.3 Estimating Population Proportions, Focus on Media: Did NBC Lose $66 Million to a Nielsen Sampling Error?, Focus on Literature: How Many Words Did Shakespeare Know? Hypothesis Testing: 9.1 Fundamentals of Hypothesis Testing, 9.2 Setting Up Hypothesis Tests, 9.3 Hypothesis Tests for Population Means, 9.4 Hypothesis Testing: Further Considerations, 9.5 Hypothesis Testing: Population Proportions, Focus on History: Where Did Statistics Begin, Focus on Agriculture: Are Genetically Modified Foods Safe? Further Applications of Statistics: 10.1 Ideas of Risk and Life Expectancy, 10.2 Statistical Paradoxes, 10.3 Hypothesis Testing with Two-Way tables, Focus on Criminology: Can You Tell a Fraud When You See One?, Focus on Education: What Can a Fourth-Grader Do with Statistics? 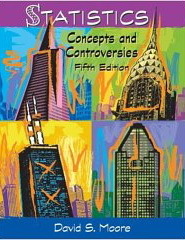 1st edition: 1995 Wadsworth Publishing. 2nd edition: 1999 Duxbury. 3rd edition: June 23, 2004 Duxbury. Chapter 1: Principles of Reasoning. (1A) The Forces of Persuasion, An Overview of Common Fallacies, (1B) Propositions: The Building Blocks of Arguments, (1C) Arguments: Deductive and Inductive, (1D) Analyzing Real Arguments. Chapter 2. Statistical Reasoning. (2A) Fundamentals of Statistics, (2B) Should you believe a Statistical Study? (2C) Basic Statistical Graphs, (2D) Graphs in the Media, (2E) Causal Connections. Chapter 3. Problems Solving Tools. (3A) Using Unit Analysis, (3B) Systems of Standardized Units, (3C) The Process of Problem Solving. Chapter 4. Numbers in the Real World. (4A) Concepts of Numbers, (4B) Uses and Abuses of Percentages, (4C) Putting Numbers in Perspective, (4D) Dealing With Uncertainty. Chapter 5. Financial Management. (5A) The Power of Compound Interest, (5B) Savings Plans (Annuities), (5C) Loan Payments, Credit Cards and Mortgages, (5D) Income Taxes, (5E) Investments. Chapter 7. Exponential Growth and Decay. (7A) Exponential Astonishment, (7B) Doubling Time and Half Life, (7C) Exponential Modeling, (7D) Real Population Growth. Chapter 9. Putting Statistics to Work. (9A) Characterizing Data, (9B) Linear Regression Models, (9C) Statistical Inference, (9D) Sample Issues in Statistical Research. Chapter 10. Mathematics and the Arts. (10A) Fundamentals of Geometry, (10B) Mathematics and Music, (10C) Perspective and Symmetry, (10D) Proportion and the Golden Ratio, (10E) Fractal Geometry. Chapter 11. Discrete Mathematics in Business and Society. (11A) Network Analysis, (11B) The Traveling Salesman Problem, (11C) Project Design, (11D) Voting. Does the Majority Always Rule?, (11E) Theory of Voting. Chapter 12. The Power of Numbers. A few more topics. (12A) Balancing the Federal Budget, (12B) Energy: Our Future Depends on it, (12C) Density and Concentration, (12D) Logarithmic Scales: Earthquakes, Sounds and Acids. Producing Data: 1 Where do Data Come From? 2 Samples Good and Bad, 3 What do Samples Tell Us, 4 Sample Surveys in the Real World, 5 Experiments Good and Bad, 6 Experiments in the Real World, 7 Data Ethics, 8 Measuring, 9 Do the Numbers Make Sense? Organizing Data: 10 Graphs Good and Bad, 11 Displaying Distributions with Graphs, 12 Displaying Distributions with Numbers, 13 Normal Distributions, 14 Describing Relationships: Scatter plots and Correlation, 15 Describing Relationships: Regression, Prediction and Causation, 16 The Consumer Price Index and Government Statistics. Inference: 21 What is a Confidence Interval?, 22 What is a Test of Significance?, 23 Use and Abuse of Statistical Inference, 24 Two-way Tables and the Chi-squared Test, 25 Inference about a Population Mean. Teaching Statistical Literacy by Peggy Cerrito in College Teaching (Jan 1, 1999). Available at HighBeam.